Would some vivid colors bring a bit of “joy” to your home office? 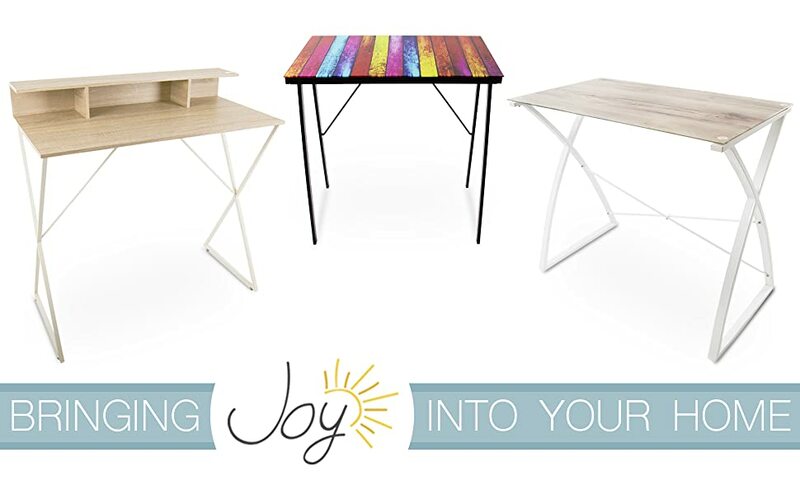 The Joy Desk Standing Workstation / Glass Computer Desk by Stand Steady will brighten up your apartment or small room with its real tempered glass top over a colorful and artistic multicolored distressed wood print! This fixed height stand up desk is super easy to put together, not to mention lightweight and space saving…perfect for tiny apartments! It’s also multipurpose, easily serving double duty as an entryway table, or for entertaining! MAXIMIZE YOUR SMALL SPACE: Small, quality furniture pieces are hard to come by. At just about 33 inches wide, your new & cool standing desk can fit in even the smallest of rooms! Being one of the smallest stand only desks on the market, it gives you all of the functionality you need to stand while you work and not consume your small space. FUN POP OF COLOR: This desk may be small, but it packs a punch…of color! From afar, the black metal legs have a sleek and modern look but up close, the vibrant glass desktop brightens up any room. LIGHTWEIGHT AND STABLE: The lightweight design of this standing table makes it extremely easy to move around. Despite it being light, it is also super stable! Two crossbars keep the legs steady and the desktop wobble-free. SIMPLE SET UP: With an assembly time of 30 minutes or less, you can put on an episode of the show you’re currently binge-watching and have your stand table set up before they can even ask if “you’re still watching”! MULTIPLE USES: Make a statement with your entryway. Perfect for housing your mail, keys and decorative vases, this standing table will amplify your space. You can also turn your small space into a home office with this trendy stand up desk. The possibilities are endless!